Top Chef Masters will be hosting Zooey Deschanel on Wednesday, August 5th at 10pm (check your local listings). Deschanel is in this summer's "500 Days of Summer." Zooey is vegan, doesn't eat soy, and is gluten intolerant. I can't wait to see what the chefs cook up for her! I apologize for slacking on my Amazon Store, but I finally updated it! Haven't been able to purchase the Betty Crocker Gluten Free Brownie Mix in your town? Buy it here. Looking for the Yellow Cake Mix? It's here! Maybe you're more into chocolate chip cookies -- don't worry, those are in the store too, right here. If you're looking for some of the quick meals I've posted about, you can check out my Quick Meals tab. A Taste of Thai, Lundberg Risotto, and ThinkThin Bites are all available in the Gluten Freeways Amazon shop. Or perhaps you're trying to lose weight this summer and are looking for sports drinks. You can find them in my shop here. Are you looking for gluten free body products? They are here in the store. If you have any suggestions for items to place in the store, leave me a comment! 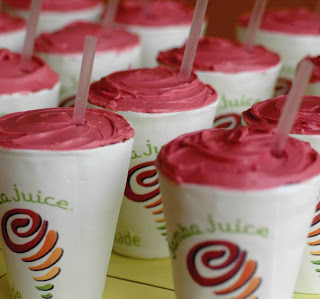 Check it out -- buy one get one free @ Jamba Juice for ANY of their smoothies until August 9th. Need refreshing, gluten free summer treats? Read my previous post here! Café Flourish is a little place on Wilshire, right by La Brea. The café does not use any animal products in creating its food, so everything is vegan too. I ordered the Mac & Cheese to go -- it was labeled gluten free on the menu. When I was called up to the counter to pick up the mac & cheese, the server gave me directions about how to heat it up. I was discouraged, however, when I noticed she included a container of bread crumbs with the dish. I asked if they were gluten free, and she said no. It made me nervous that they may serve up the Mac & Cheese with these breadcrumbs regularly. Definitely make sure to specify that the bread crumbs should not be used! I took the Mac & Cheese home and heated it up the next day and it was delicious! It's a little spicy, but the flavor was great. Café Flourish uses rice elbow noodles and soy cheese. Normally soy cheese wouldn't appeal to me so I was definitely surprised by the flavor of the Mac & Cheese. I also bought a whoopie pie, consisting of two small chocolate cookies with something resembling cool whip in the middle. The whoopie pie was pretty plain and not flavorful. I would not order it again. When I spoke to the chef at Café Flourish, she said that many of their dishes could be prepared gluten free very easily. Last night I had the great pleasure of eating at Fritto Misto, an Italian restaurant in Santa Monica. My friend Margaux and I went after trying to check out Garlic Jim's in Pasadena with no luck at scheduling a date. Now that she has moved to the Westside of Los Angeles, it is much easier for us to meet up. I sat down as I waited for Margaux and hungrily eyed the menu. My stomach was growling and I couldn't wait to eat. 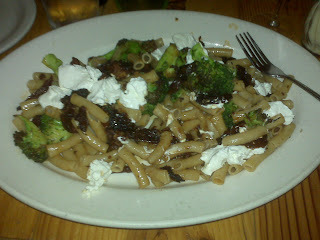 I decided to have the gluten free pasta with goat cheese, sundried tomatoes, broccoli, and a light olive oil sauce. Any dish on the menu can be replaced with gluten free pasta, or you can create your own pasta and choose your preferred meat, sauce, and extras. When I asked for the gluten free pasta, my waitress even asked me if I wanted it prepared in a separate pot. I was pleasantly surprised that the waitstaff was trained to ask about separate cooking procedures for gluten free food. The dish was excellent. The pasta itself was just OK -- I would recommend that the restaurant try using a different kind of elbow pasta and perhaps experimenting with different brands. I did mention this to the waitress and she was receptive. However the flavors were wonderful. Margaux ordered one of the salmon specials with gluten, so I wasn't able to try it. However she tried mine, and said that mine was even better than hers! Another great part of the restaurant is that it is BYOB with a $2 corkage fee per person. The restaurant also has a gluten free dessert available, a chocolate flourless cake. I took it him (Margaux had already promised me great gelato dessert) and ate it the next day. It was delicious! I absolutely loved Fritto Misto. The waitstaff was helpful, the food was delicious, and there were enough great options for me to return again and again. The Celiac Disease Center of Columbia University now has a YouTube channel. Check it out here. 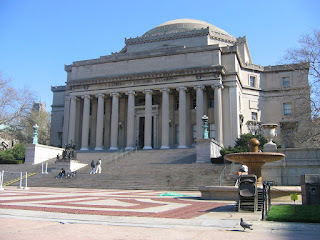 "The Celiac Disease Center at Columbia University was established within the Department of Medicine at Columbia University in 2001 under the guidance of Peter Green, MD, one of a few recognized experts on celiac disease in the United States. The Centers mission is to redefine the future of celiac disease and treatment through continuing advances in patient care, research, education and patient advocacy. The Celiac Disease Center at Columbia University is one of a few centers in the United States that provides comprehensive medical care, including nutritional counseling, for adult and pediatric patients with celiac disease. All of the Centers research is directed toward celiac disease clinical, epidemiology, and mechanisms of pathogenesis of celiac disease and patient and physician education. The Center diagnosed and treated more than 2800 patients in 2008. Additional information is available online at www.celiacdiseasecenter.org." I cannot embed the videos, so check out the Center's channel here. Fresh Brothers will be serving up gluten free pizza at this weekend's Hermosa Beach Green Expo. 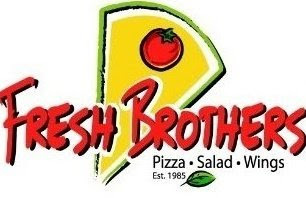 Check out my previous post on Fresh Brothers here. The Green Expo runs from 12pm-7pm on Sunday, July 26th. West Hollywood has published a great website with a ton of restaurant deals. Check out all of the deals here! Asia de Cuba's New York location has a separate gluten free menu. When I called the location here in L.A., I was told that there was no such menu. However, the woman I spoke with said that diners can speak to the chef about tweaking certain menu items to be made gluten free. If nothing else, the cocktails are heavily discounted! 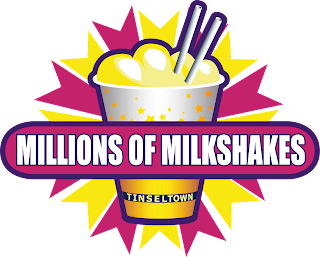 Millions of Milkshakes, another one of my favorite West Hollywood spots, is offering 10% off to all "West Hollywood Insiders." Check out my previous post on Millions of Milkshakes here. Z Pizza is also offering 20% off -- check out my previous post on Z Pizza here. Remember that this is just for the West Hollywood location. I'm taking a little break from L.A. for this post (sorry!) and going back to where I spent the previous four years -- Boston. I went to a small university a little outside of Boston and loved my time there. I was diagnosed with Celiac after my freshman year of college, and when I returned to Boston I started exploring the gluten free scene. That was back in 2005 and I think that in the four years since there has been an explosion of gluten free food available in Boston. I've written about P.F. Chang's in the past, and that place was my go to jam in Boston (and they just opened a second location!). I also hit up Fleming's a few times, a restaurant owned by the company that owns P.F. Chang's. Check out my Fleming's post here. Since I've left, I've heard of new places like Stone Hearth Pizza and Nebo, but unfortunately never ate at either place. Of course, there's always the classic Boston spot Legal Sea Foods. Legal Sea Foods has gluten free menus available at select locations -- click here to see if there is one available at your nearest location. My university was very close to a great cupcake shop, Kickass Cupcakes. 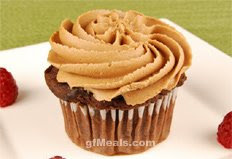 This little shop located in Davis Square serves up great gluten free cupcakes along with tons of wheat-filled cupcakes. Whenever I was in the dog house with my roommates I picked up a few Kickass Cupcakes and all was forgiven. The gluten free cupcakes come in a few different flavors including vanilla, chocolate, lucky and mojito. I've never experienced the "lucky" flavor so I can't speak to that, but the other flavors are delicious. The cupcakes are always freshly baked. The storefront is small and the bakers are extremely friendly and placing gluten free orders was never a problem. The short walk from campus to Kickass Cupcakes in Davis Sq. is one of the things that I miss most about living in Boston. A lot of buzz has surrounded Betty Crocker coming out with gluten free mixes available at most grocers. The question always is: Are they any good? Betty Crocker contacted me and told me they wanted to send me a "prize pack" with all 4 new gluten free mixes and a reusable grocery bag. The best part about the deal was that I get to give away a "prize pack" to one of YOU! Read below for further details on that. There are four mixes: brownies, chocolate chip cookies, yellow cake, and devil's food cake. I baked all four of them before this review. The brownies were the first recipe that I attempted. I have to admit that I am not a baker; my sister is the baker of the family and whenever I visit her I'm sure to arrive to at least three gluten free treats. Since I'm a novice baker, I chose the brownies because the directions were simplest: mix butter, two eggs, and the Betty Crocker mix together, pour into a pan, and put the pan into the oven. That's it! The brownies were extremely simple to make and even easier to eat. They were delicious! I've had other types of gluten free brownies before, and almost none of them were as good as these. I had varying degrees of success with the other mixes. The chocolate chip cookies were good, but unfortunately most of them came out burned. I have a tiny oven in my apartment so I wasn't able to use a true cookie sheet and instead used the same pan that I had used for making the brownies. I had to bake the cookies four at a time! It was frustrating and perhaps why they did not cook as easily as the brownies. I set the chocolate chip cookies out when I had people over to my apartment for my roommate's birthday, and they were a big hit. Most people didn't know they were gluten free and were surprised after I told them. I think that speaks to the quality of the Betty Crocker mixes. Unfortunately I do have have photos of the other two mixes that I made. However my experience making them was similar to my experience making the brownies -- they were simple to prepare, baked well, and were delicious! Perhaps the best part about these mixes is that they are located at almost every market. It isn't normally easy to walk into a Ralph's, Pavilions, or Vons and find gluten free mixes. At the Ralph's I visited the mixes were also reasonably priced at $3.99. While Trader Joe's provides a cheaper mix (there brownie mix is about $2.75), I had a much easier and enjoyable experience with the Betty Crocker mixes. Check out the prize pack you could win! It comes with all four mixes, a reusable grocery bag, a pad of paper and pen! So here are the details: there are a few ways to enter into the drawing for the prize pack. First, you can leave a comment on this post with your favorite L.A. gluten free hotspot and why it is your favorite -- it doesn't have to be something I have written about in the past! Second, for those of you not in Los Angeles, leave a comment detailing your favorite Gluten Freeways post and why it is your favorite! Please Note that at this time Betty Crocker can only ship to the contiguous 48 states. Also please note that I must approve comments because of an issue I had with a spammer, so do not be concerned if your comment does not show up automatically. The deadline to submit your comment is July 31st. After that I will hold a random drawing. If you decide to enter the contest by leaving a comment, please make sure to leave some form of contact with your comment so I can contact you if you are the lucky winner! 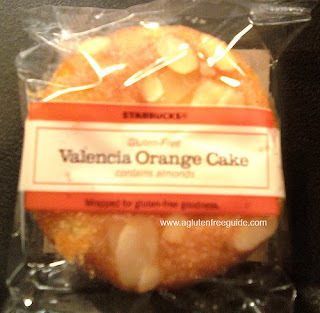 Gluten Free living, a great blog, has an interesting post about the recent decision by Starbucks to discontinue the Gluten Free Orange Valencia Cake. 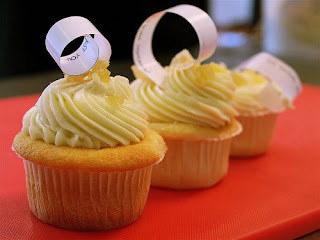 In sum, the blogger spoke to a representative from Starbucks, who said that the Orange Valencia cake was too much of a treat that Starbucks customers would not eat every day. Well, duh. The representative also says that Starbucks is not against creating another gluten free product. I vote for sandwiches -- I've said it before, and I will say it again, but when I visited a Starbucks in London they had fresh gluten free sandwiches on the shelves! What do YOU think Starbucks should do? They have replaced the Orange Valencia Cake with Kind Bars. So asks The Huffington Post because it is, of course, that time of year. I clicked on their "12 diets to get you Teenie-Weenie" and, lo and behold, the gluten free diet was featured! What do YOU think -- is supporting the gluten free diet a good idea? I'm happy that at least The Huffington Post mentioned that it is a diet normally followed by Celiacs. Almost all Celiacs were extremely excited to hear the news of Starbucks creating a gluten free product for us. We were even more excited when it was released! Unfortunately for us fans of the product, it seems that Starbucks will be discontinuing it. The official Starbucks twitter account said: "We heard that it was too much of a treat, and not a nutritious snack. The @KindSnacks bar is replacing it." The @ is part of Twitter talk for those of you not yet tweeting. Personally, I agree with this decision. I hope that Starbucks takes the time to do some R & D and really reach out to consumers to decide what we want. I would vote for a sandwich. I've said it before -- when I visited London I walked into a Starbucks and was shocked to find a fresh, gluten free sandwich. Why doesn't Starbucks produce an option that is viable for Celiacs to eat as a breakfast or lunch? The Orange Valencia Cake was delicious but it was too much of a dessert for my taste. What do YOU think? And what do you think about Starbucks replacing it with KindBars? I was walking through my local Ralph's and noticed that there were an enormous amount of gluten free products on the shelves. Has anybody else noticed an incredible increase in the amount of products labeled "Gluten Free" on the shelves? As I walked by the freezer section I spotted a few different frozen entrées, all of which were marked with large letters "gluten free café." I picked up the Fettucini Alfredo -- it's been years since the last time I remember having fettucini alfredo so I decided to give it a shot. I was not disappointed. The product is a single serving of rice noodles "smothered" in a creamy parmesean and romano cheese sauce (and yes, "smothered" was the company's word of choice). The dish was definitely the best frozen item I have ever prepared. All I had to do was punch the fork through the wrapping that encased the pasta and put it in the microwave for 3 minutes. Then I stirred the pasta up and put it back in the microwave for 2 minutes. That's it! No water or anything is needed. Perhaps more surprising than the simple preparation was the fact that the product tastes great. As I said, I haven't had fettuccini alfredo in a long time, and I had the same concerns I normally do for frozen/microwaveable products: would the noodles be too soft? too hard? would it not come out cooked? was it annoying to prepare? Fortunately, Gluten Free Café suffered from none of these problems. 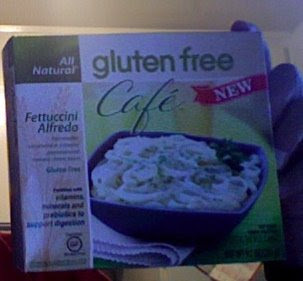 I loved my Gluten Free Café product -- it is definitely the best frozen gluten free meal I have tried yet. The brand's four products are: Fettucini Alfredo, Lemon Basil Chicken, Asian Noodles, and Pasta Primavera. I was recently invited to try out Garlic Jim's Pizza. I've been meaning to get to one of their locations for a long time now, but again, the L.A. sprawl stopped me in my tracks. Luckily, I had a good reason to stop in at the Redondo Beach location -- my friend moved down to Irvine from Palo Alto on Friday, so I drove down after work to help her move in. Even though she isn't gluten free, she's a gluten free ally (haha) and I knew that a pizza would help welcome her to her new apartment. I was pleasantly surprised when I pulled up to the Garlic Jim's location in Redondo and saw the below sign greeting me. I've definitely noticed a change in gluten free advertisements -- they are much more pronounced. Check out the labeling on Chex or Betty Crocker's Gluten Free mixes. The words "Gluten Free" are no longer relegated to tiny print below the Nutritional Information label, and I think that it speaks to the increasing number of Celiacs and the power that our money has in convincing restaurants and food manufacturers to create well-marked gluten free labels. But now to the important information -- the pizza! I ordered a large Queen Margherita for my friends and I. The pizza was great! I'll let my non-gluten free friend's description say it all: the pizza was "light, tasty, and a pretty substantial substitute to gluten-filled pizza. It was a healthy alternative to pizza, I didn't feel like I was eating cardboard or anything." I couldn't agree with my friend's review more. I really enjoyed Garlic Jim's pizza. It is a thin-crust pizza and I'm into thicker crusts, but I thought the pizza was particularly flavorful. A lot of gluten free pizzas can be bland but Garlic Jim's was anything but. I would definitely eat at Garlic Jim's again if there were locations closer to me. 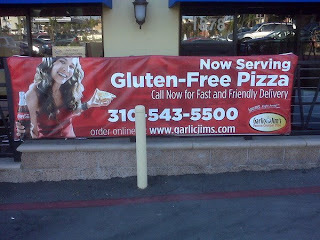 Garlic Jim's has locations in Burbank, Pasadena, Redondo Beach, Simi Valley, and South Pasadena. Follow Garlic Jim's Pizza on Twitter here. Follow Gluten Freeway L.A. on Twitter here. Fresh Brothers has a new location coming, and I can exclusively reveal it to you! Check out my previous post on Fresh Brothers here. 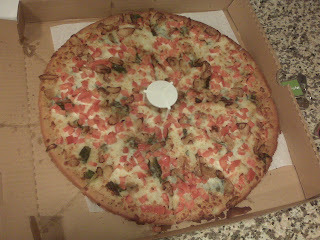 So now us who live above the 10 won't have to hike down to Manhattan/Redondo to enjoy the awesome Fresh Brothers pizza! Another great part is that right next door is a Pinkberry and a location of The Counter. Check out my previous post on Pinkberry here and here you can see my previous post on The Counter. I don't have a firm opening date yet, but as soon as I do you will be the first to know! I had been meaning to check out GF Meals by Your Dinner Secret for a long time, but unfortunately the grind of law school precluded me from going. Luckily it's summertime, and I finally visited the shop. In hindsight, which of course is 20/20, I'm an idiot for not going sooner. GF Meals has a ton of great freshly prepared and freshly frozen meals ready for you to purchase and take home with you. The shop is located conveniently close to the 101 Freeway in Woodland Hills. Perhaps the best part of visiting the shop was the helpful staff. I was guided through the different options by the chef and the owner of GF Meals, both of whom helped me make my decisions. I walked out of the shop with cupcakes, the Asian-Style Orange Chicken with Lavender Jasmine Rice, and a loaf of bread. The first thing I tried was the chocolate cupcakes with chocolate frosting. I was not disappointed by the cupcakes -- they were awesome! The cupcakes are freshly frozen (as is everything else) so I heated the cupcake up in the microwave before snacking on it. Sometimes when I do this it makes the cake part of the cupcake too gooey. That wasn't the case for GF Meals' cupcakes; they microwaved perfectly, an important feature when everything in the shop is frozen. The next dish I tried was the Asian-Style Orange Chicken with Lavender Jasmine Rice. There were very simple and easy-to-follow directions included with the chicken. The directions were great for a novice (read: me) and I really appreciated having them. 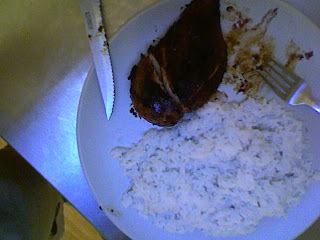 More than that, I appreciated that the final result was awesomely tasty. It's infrequent that I'm able to eat Asian-Style anything other than P.F. Chang's, so this was a nice respite from that food (although I do love P.F. Chang's). The meal was easy to prepare and delectable. I have to be honest -- I have yet to try the bread!! It's terrible, I know, but after getting so used to NOT eating bread I always forget to try it. I will update the review once I do try it. Despite that, what I can say is this: GF Meals is delicious and has an enormous variety of freshly frozen meal options. The best part is that they always have a ton of sales going on. Click here to sign up for the e-mail newsletter to keep informed of the sales going on at GF Meals. In addition to their Woodland Hills outpost, GF Meals also ships nationwide. However, for us Angelenos, it certainly makes more sense to go into the store here in L.A. The store ships their products through a third party so it is not advisable for Angelenos to have their orders shipped. GF Meals also does frequent deliveries to Irvine for you Orange County folk. I just saw a great new product in the store -- A Taste of Thai. 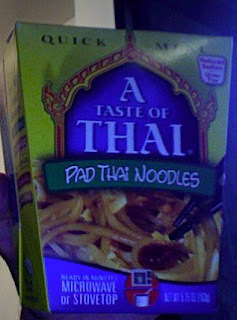 A Taste of Thai makes a ton of different products including noodles, rice, sauces, seasonings, soups, and quick meals. I tried the Pad Thai Noodles quick meal and was pleasantly surprised. It's really easy to put together -- you use the carton itself to prepare the meal in the microwave. Barely any prep is needed. Just put the noodles in the carton with some water and the included sauce. Then place it in the microwave for the appropriate time and voila! You have yourself a meal. The noodles had a great taste to them. I enjoyed them more than other Thai quick noodle products I've tried in the past. Unfortunately I forgot to take pictures -- sorry! Perhaps the best part about A Taste of Thai is that, according to the list here on the company's site, all of the products are gluten free. Even better, they are marked as such on the front of the box in the upper right hand corner. You can buy the products online here. You can also find a store that carries A Taste of Thai's products on the right hand column of the company's main page here.